J/News Articles: Araujo Crowned BOSCH Spanish J/70 Champion! (Vigo, Spain)- The Real Club Nautico de Vigo has been preparing for the 2018 edition of the J/70 European Championship for months. As part of their preparation and training for their club members and Race Committee volunteers, they hosted the Vigo J/70 Winter & Spring Series for two dozen boats. In addition, as the penultimate test of their team, they also hosted this year’s BOSCH Spanish J/70 Nationals as the precursor-training program for both Spanish crews as well as their European visitors wishing to learn more about the waters off Vigo. Thirty-one teams participated in the BOSCH Spanish J/70 Nationals and five races were run over the weekend event. The event had tremendous support from Galician institutions, including the Concello de Vigo, the Diputación de Pontevedra, the Port of Vigo, and the Xunta de Galicia. In the end, it was Gonzalo Araujo and his team from LAGUARDIA & MOREIRA-LAUFEN was crowned the champions after posting a very consistent scoreline of 2-1-8-7-5 for 23 pts total. It was big win for the local favorites as they were carrying the flag for the host- Real Club Nautico de Vigo! Taking the silver was the duo of Alfredo Gonzalez and Federico Morales on MARINA RUBICON, sailing for the Real Club Nautico de Arrecife. They started fast, but faded in the end, recording a tally of 1-2-10-6-7 for 26 pts. Sitting just one point lower to take the bronze was the two-time J/80 World Champion, Jose Maria “Pichu” Torcida on NOTICIA, posting the most consistent scores of 6-7-6-4-4 for 27 pts. 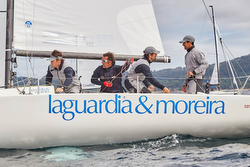 His team from Real Club Maritimo de Santander has been a force in the Spanish J/80 class for over a decade and has now taken to the J/70 class like ducks to water. Notably, they took 2nd in the blustery, windy 2017 J/70 Europeans sailed on the Solent in the United Kingdom. They will be a force to be reckoned with in the J/70 Europeans next week!